There’s a fantastic variety of activities in and around Polmark Beach Cottages. Enjoy our courtyard garden and Harlyn Bay beach 150 yards away, and explore the 6 other beaches within 3.5 miles of the Polmark. Keep everyone entertained with surfing, golf and cycling. There’s plenty of space around the Polmark to relax. On sunny days spend a lazy afternoon at your cottage, many have their own sun terrace or garden. We also have our courtyard garden around which many of our cottages are situated and there is also a barbecue area, situated at the top of the complex, with lovely views of the surrounding countryside. 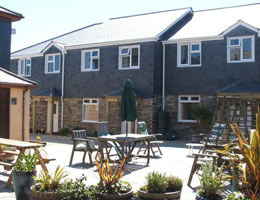 Cottages Morwennol and Polmark have private gardens with a views out to the Atlantic – great for barbecues. Polmark is ideally situated for beaches, just a few minutes walk from Harlyn Bay, one of the best family beaches in Cornwall, with great water quality and lifeguard cover in the summer. Relax there, try surfing and get 10% off tuition with our special surfing breaks. 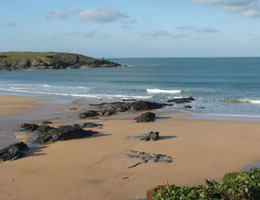 There’s a beach for every day of the week with 6 other beaches within 3.5 miles, including: Constantine, Treyarnon, Trevone, Boobys, Porthcothan and Mother Ivey’s Bay. Cornwall is a large county. 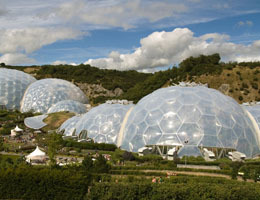 Our location half-way down the coast makes a great base from which to explore places and attractions such as the Padstow peninsular or Tintagel – King Arthur’s legendary castle, Bodmin Moor, The Eden Project, Truro and St Ives or the many National Trust properties and independent attractions locally. At the end of the day don’t forget to try one of the local pubs and restaurants. We have reviewed and recommended our favourites . From Rick Stein‘s five eateries ( including a Fish and Chip shop), to quaint local pubs and wine bars, there is something for everybody and their budget in the Padstow area. For events local to the cottages see the list below. Check the Special Offers page too as we may have offers to coincide with the events. 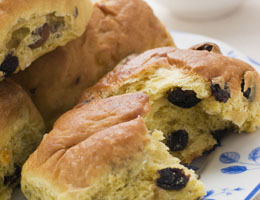 For events all around the county please see the VisitCornwall website.